I'm over the moon about Friday's event and wanted to share the story behind it. 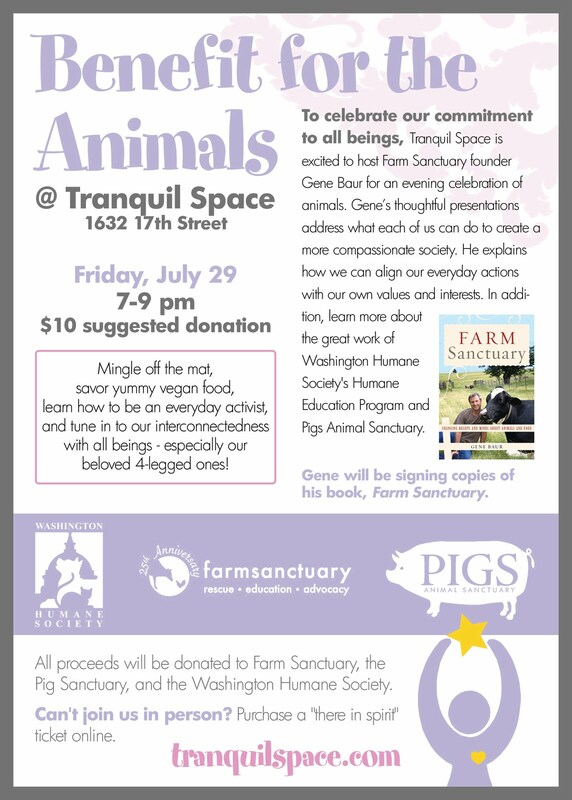 Tranquil Space has been a supporter of Farm Sanctuary ever since I learned about their amazing work in my 2007 Jivamukti teacher training. Last December I found out that 2011 was their 25th year anniversary (woo-hoo!) and that Gene Baur, the founder, was doing a big tour for it. A light bulb went off and I began concocting an event. I reached out to another organization we work with a lot, Washington Humane Society, and requested they get involved, share information on their Humane Education program (where we tend to send the majority of our donations), and bring animals for adoption (yes, we'll have cats and dogs at the event)! Finally, after joining the Board of Pigs Animal Sanctuary (and stalking Walter the Pig for the past 10 months), I invited them to be involved, too. The 2-hours will involve mingling off the mat with fellow Tranquil Space yogis and animal lovers, a presentation by Gene on everyday activism, a presentation by WHS Humane Educator, a booksiging of Gene's Farm Sanctuary book, yummy local vegan food by Sticky Fingers and Cafe Green, and cats and dogs available for adoption. To gain more insight into Gene, here's a snippet of his recent interview on Martha Stewart. Please join us for this special event in honor of 4-legged beings. All animal lovers welcOMe. Booked Friday night or live in Australia? Please consider purchasing a $10 "in spirit" ticket. All proceeds will be given to these three amazing organizations practicing their yoga off the mat every single day. P.S. We need a few volunteers to welcome guests and serve yummy Tevolution tea. If you're available, please let me know.